We water test and rate the Northbank 750HT, a finalist in the fibreglass fishing boats category at the 2016 Australia’s Greatest Boats awards. "Northbank nailed it!" cried judge Kevin Smith as he leapt out of the Northbank 750HT with a cheesy grin of satisfaction. For those who know Kev and his sense of dry wit, you will understand it is no easy task to impress him, let alone rock his very foundations. Yet he wasn’t the only AGB 2016 judge that felt the same about the beautiful, yet rugged Northbank 750 Hardtop that came all the way from the land of the Crow Eaters to joust with other contestants in the impressive national lineup. The Northbank 750HT is a large, extremely deep-sided fishing platform with attractive lines and an enticing full-bodied seduction. However she is also a thrifty powerhouse fitted with the gutsy Volvo Penta D4 marine diesel engine and duoprop leg transmitting enormous torque with powerful grip and a thrilling top end, all with miserly fuel consumption. She supplies amazing economy figures, such as one-to-one fuel consumption (one litre to the nautical mile) at a comfortable 20kts. You can cover plenty of ground for very little expense at that rate and still have around 350nm range. The Northbank 750HT has proven construction credentials, being built to stringent marine survey standards. Her deep-vee hull and low centre of gravity provides not only excellent stability, but also plenty of head room, especially for tall anglers like our illustrious editor, Tim van Duyl, who exclaimed "I fit!". All of our judges commented on the Northbank 750HT’s nimble attitude in turns but extreme confidence in facing offshore slop and swell. They were all impressed with the ability to handle shifting weight with a minimum of fuss. The combination of layout and ergonomics combines with sensible overall presentation and a ton of fishy features. We all love the ideal of diesel power due to its inherent safety, longevity and economy, yet many previous offerings have been excessively noisy — but not the Volvo D4 in the Northbank 750 Hardtop. Instead it had a very pleasing and confident note that matched its enormous ability. John Ford noted that it actually enhanced his sense of security in a most appealing vessel. While the Northbank 750HT is "packed to the gunwales with Wow Factor" it also combines "classic looks with modern touches in a package that you can take straight to the continental shelf right out of the factory", noted Peter Beattie. 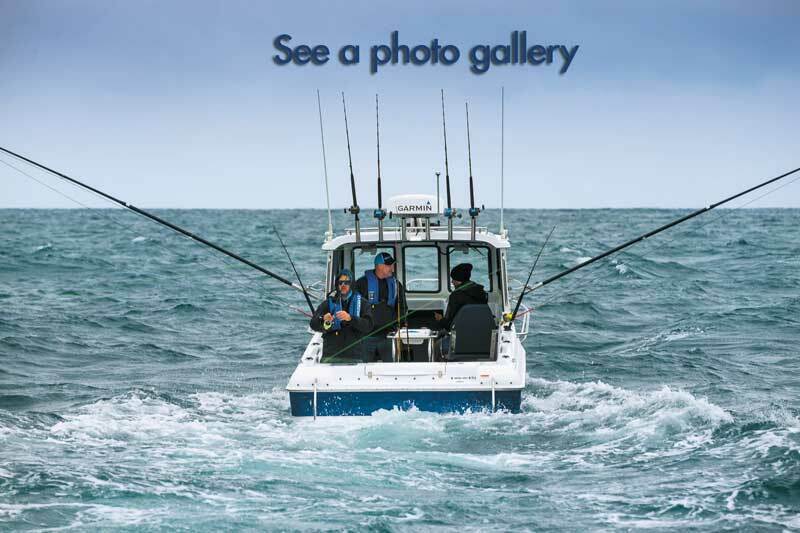 It truly is a serious boat for serious fishos, combining a vast array of tried and proven features in a comfortable and very workable layout, with some added features like the centrally mounted work station. 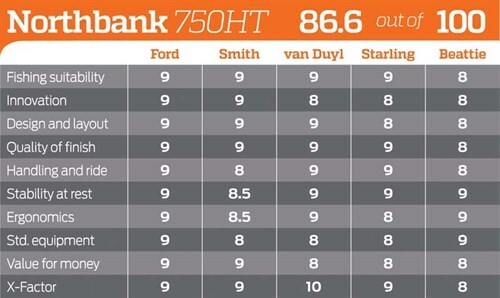 The Northbank 750HT was one off the largest vessels competing in Australia’s Greatest Boats 2016 and it certainly proved its qualification as one of Australia’s greatest fibreglass fishing boat. If we were off to battle we would be confident of victory with a warhorse such as the Northbank 750HT as our humble steed. Big game and bottom fisher, all in one. As a tough, competent offshore fisher the Northbank 750HT ticks just about every box. And it’s built to Survey standard, so is cleverly designed to handle big seas. Take it anywhere gameboat complete with autopilot and massive range, what more could you want? As a serious bluewater sportsfishing/gamefishing vessel, this inboard-powered fibreglass vessel really excels. This is the best vessel to date out of the Northbank factory. A long-range fibreglass fishing boat with roomy cockpit and very high freeboard. You'd be safe off the shelf with a big safety margin for serious offshore adventures. The world needs more trailerable game boats with the range the Volvo D4 gives the Northbank 750HT. Neat new transom design. Central baitstation is a space-saver and utilises an otherwise unused space, but needs overboard drain system for this bait table. Not a lot that is new or innovative, except perhaps the ignition system, but still a very nice incorporation of marine diesel engine inboard power into this class of vessel. Clever and very functional — optional central bait station. Inboard diesel transforms the standard offshore trailerboat into something more like a sportsfisher. Quite a good looking boat. Very functional as a serious offshore fisher. A great deep cockpit that could comfortably fish four. Fuel mileage works out to give around a 350nm range. Classic looks with modern touches. Dressed for success and ready to rumble. Design and layout are great. Visually, the boat is quite appealing with nice lines. Access and usability are all good with very deep gunwales. They almost verge on too-high for some forms of fishing (jigging)! Very stylish with flowing design. Laid out very well for fishing. The engine cover intrudes, but it is at the engine anyway. Walkaround bait station is innovative. Serious offshore fishability is the key factor and they nailed it. A nice combo of modern versus original. Top quality gelcoat, with a neat, compact lined cabin. But I didn’t like the raw glass inside the cabin. A big step up in quality in the cab, though. A very high standard of upholstery and fitting — loved the seats. One small criticism — the screws holding the footpads for step to go forward were exposed on the inside and quite sharp. One of the best locally made boats I've been on. Attention to detail was impressive. Very well-finished and well-presented boat. Quality deck fittings and stainless work. Quality seats. One of the neater and more well-trimmed finishes I've seen for a while in this category of boat. Steers and handles well and suits the torque-y engine. Takes big seas in its stride. Relatively dry boat, but takes occasional spray over the bow. Huge torque from the Volvo pushes the Northbank 750HT effortlessly. I pushed the 750 HT hard but never felt like I found its limits. Designed for long-range economy, it’s a superb sit-back-and-relax at 20-25 knots offshore trailerboat. Excellent ride — up, down and across the sea. Feels very safe and sure and is dry also. A big heavy boat that rode through 1.5m swells. Some banging over bigger waves, but it turns well. Very stable in up to the 1.5m swell we tested in. Very stable — handles shifting weight well. Big Volvo and Duo-Prop combo drop the centre of gravity giving great stability. A very stable fishing platform, relatively immune to shifting weight. Ultra-high gunwales and good stability on this Northbank fibreglass boat create a comfortable offshore fishing platform. Great helm position, super comfy seats. Enough room to move and hey, the cabin is over 2m high. An ideally set out cab and dash area that’s spacious and uncluttered. Back to basics seating. It would be good to see Eskies/coolers below seats. The helm layout is relatively simple and straightforward. Overall storage is a bit limited, due to the inboard engine taking up underfloor space. Good to very good ergonomics. A couple of dash controls [tilt/trim] could have been better placed, but not bad overall. Easy access all round and the central bait station is good. The helm is great and the seating position is very comfortable. Enough room in the cab to stretch out on the bunk. Offshore ready including labels for all safety gear — all boats should come like this. Loved the overhead wiper switch, no more bumping every other switch clearing the screens. Wiper wash, stainless work, radar all good. This boat had some extra options — central workstation and ice box. But standards are pretty good overall. Pretty highly specc-ed as standard. Ready to take to the shelf straight from the factory. Simple and spacious without too much unnecessary bling is on offer, but what you get is good quality all-round. You will be the envy of your mates and probably won't want to ever sell this boat! This is not a cheap boat, but it represents a lot of value, given its standard specs and serious offshore capability. Well kitted-out and ready to go. Could have benefitted with a toilet, rear wall option would be a good extra? At $196,500 this is another very pricey rig, but you get what you pay for — so value is pretty good, especially with that marine diesel inboard. Serious money for serious fishos. WOW factor for me was the fast, highly responsive and "nippy" diesel that was neither noisy nor smelly! One-to-one fuel consumption at 20knots giving a 350nm range is outrageous but better yet, at 6-7knots, we worked out a 700nm range — beat that outboards! Diesel trailerable game boat? I want one! 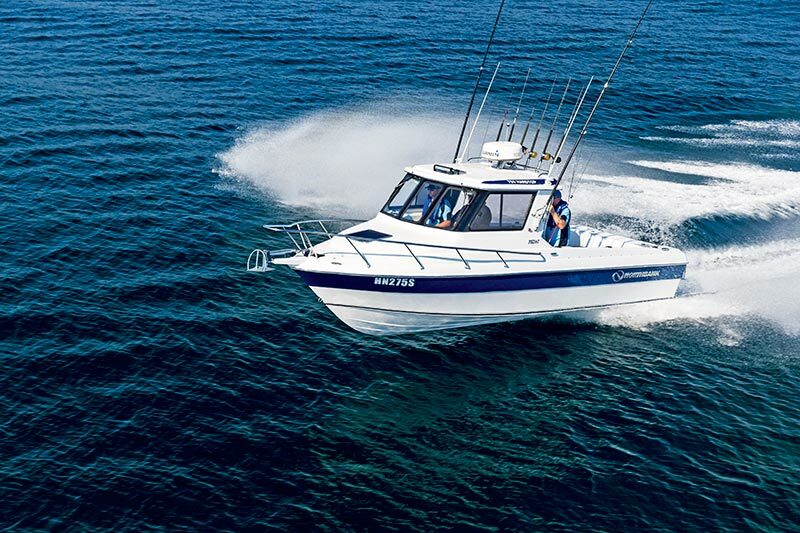 For serious offshore fishos, this boat is packed to the gunwales with WOW factor. 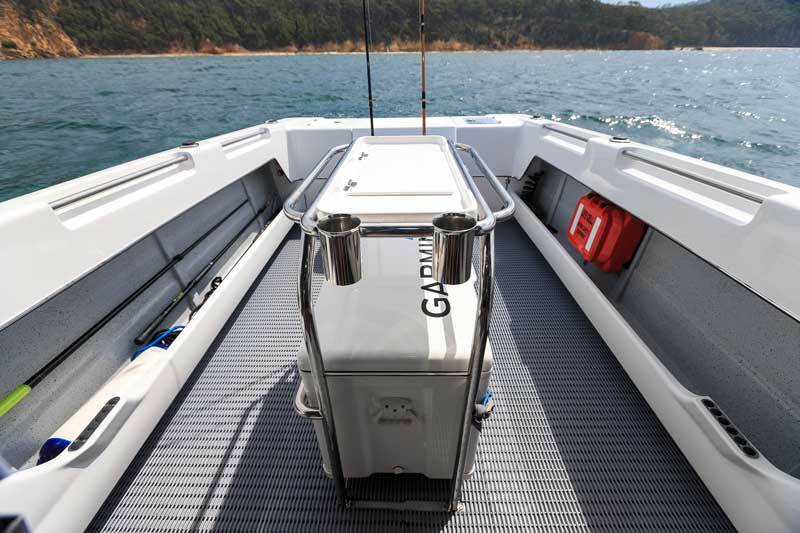 Whether it’s in the diesel version or an outboard — the Northbank 750HT ticks all the boxes and is most certainly 'up there' when it comes to proudly Australian built boats.